Mix dressing and curry powder; pour over chicken in shallow dish. Refrigerate 10 min. to marinate. Heat large nonstick skillet sprayed with cooking spray on medium-high heat. Add chicken and vegetables; cook 10 min. or until chicken is cooked through (170ºF), turning chicken over and stirring vegetables after 5 min. Stir in broth and rice. Bring to boil. Remove from heat. Stir in remaining ingredients; cover. Let stand 10 min. Curry powder is a blend of up to 20 spices, herbs and seeds. Since curry powder loses its pungency quickly, store it in an airtight container and use within 2 months after purchase. Try using 2 Tbsp. chopped gingerroot instead of the ground ginger. Or for a little heat, add a dash of dried red chiles. Save time by preparing a double batch. Then either freeze the leftovers to serve another night or heat them up the next day for lunch. 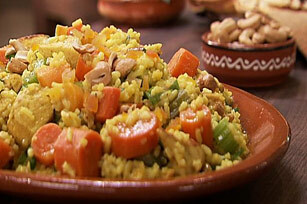 The carrots in this Indian-inspired dish provide both colour and an excellent source of vitamin A.